The elegant Aegean Suites Hotel is set on a hillside just outside Skiathos town only 500m from the sandy beach of Megali Ammos on the island paradise of Skiathos. Built in a traditional architectural design and sitting proudly with outstanding views of the sapphire blue Aegean Sea, this adults-only, all-suite hotel is a hidden 5-star retreat perfect for couples and friends with an exclusive air of personal service, and attention to detail. Richly decorated and well-appointed standard and deluxe suites provide a comfortable base from which to explore nearby beaches and villages and experience real Greek hospitality. The establishment features a gourmet restaurant, another by the pool, a lounge bar and a pool bar. The onsite spa features a beauty corner as well offering facial treatments, pedicures & manicures along with a plethora of massages and therapies. There’s also a state of the art gym featuring the latest in cardiovascular equipment. The Aegean Suites Hotel makes a luxurious base for exploring the superb beaches of Skiathos. 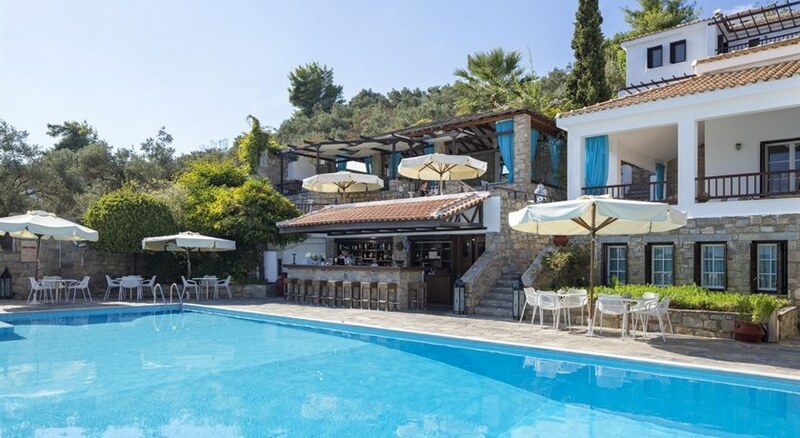 With scuba diving, riding and tennis available nearby and Skiathos town close for shops, cafés and nightclubs, this adult-only hotel is perfect for a fun holiday in Greece. There are several restaurants, bars, pubs and shops that are in close vicinity to the property. The Skiathos International Airport is 4.2km from the hotel. Being an adult-only hotel, the all-suite accommodation works best for guests, giving them the much needed privacy. The spacious suites are categorised as standard suite, deluxe suite, charming suite, heaven suite and two-bedroom suite. The suites come with the necessary amenities to enable a relaxing holiday. 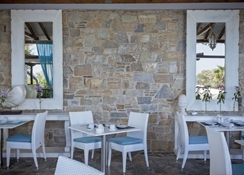 Guests at the Aegean Suites Hotel can start their day with a rich a la carte breakfast and made to order egg dishes, while the Karavia Lunch Restaurant provides refreshing drinks, lunches and snacks all day long. Guests will delight in the elegant Pelagos Restaurant with its Mediterranean Gourmet signature plates along with breath-taking views of the Aegean Sea. The attractive Bourbon & Champagne bar is perfect for toasting any occasion. 24-hour in room dining ensures convenience and complete privacy with an air of romance. Bed and Breakfast with an option for Half Board. The Aegean Suites Hotel features an inviting pool that overlooks the beach. The onsite spa with its beauty corner offers facial treatments, pedicures & manicures along with a plethora of massages and therapies. There’s also a state of the art gym featuring the latest in cardiovascular equipment. Facilities provided by the establishment include: 24-hour concierge services, reception (providing information and services), 24-hour room service, car & bike rentals, free safety deposit boxes, free wireless internet in guest rooms and public areas, twice daily housekeeping, laundry service, gift corner, full service business centre, helicopter, private jet, yachts (on request), car parking area among others.